Investing in the business is a key skill, timing this investment is important too. There is the train of thought that when you start a business like photography services, you need the best camera gear, latest editing software, high spec studio and the best materials. If you are lucky enough to be in a position to purchase all these things and not suffer the long-term pain of debt, happy days! However most wannabe photographers are not in this position. If photography is truly your passion and establishing yourself in this world as a respected source of skills, then building your business slowly and methodically whilst learning from and assisting others more established and experienced than you is the way forward. Winning your first proper job and getting experience en route to that job means learning your craft. This is investment in yourself i.e. the business. Putting time and effort into these kind of relationships lays the groundwork for your network of contacts, establishing an ecosystem of trust and networking where others can tout your services on your behalf. Joining a professional association like the SWPP and/or you local camera club is a good starting point. This may seem counterproductive but the outlay on equipment can be too much for most. Far better to rent cameras and lenses to get some practice while you are learning the craft. Photography on most levels means dealing with others and being around large groups of people. Investing in your people skills is a massive part of establishing yourself in event and portrait photography. Rounding your edges, being empathetic, patient and dynamic are all aspects that can be worked on. Consider training courses. Needless to say, or perhaps not, if you are going to work in event environments and in public-facing locations where the subjects might be required to face your direction then it is critical to be properly insured. Random events cannot be accounted for, even seemingly small accidents such as someone tripping over your equipment. Not a position anyone wants to be incorrectly covered for. Unfortunately this is not something to be scrimped on as this is your shop window and more than likely your pride and joy. Comparison to other companies is inevitable so being of a certain standard will go some way to separating you from the lesser competition. Showcase this via your web site to, remember this is your 24/7 shop window. Your skills are as a photographer and maybe there are other things you do well, but there will almost certainly be things you don’t do well or simply don’t have the time. Investing in these areas with people or outsourcing will move your business forward faster and more efficiently. Web design, accountancy, paper work, marketing literature, etc. 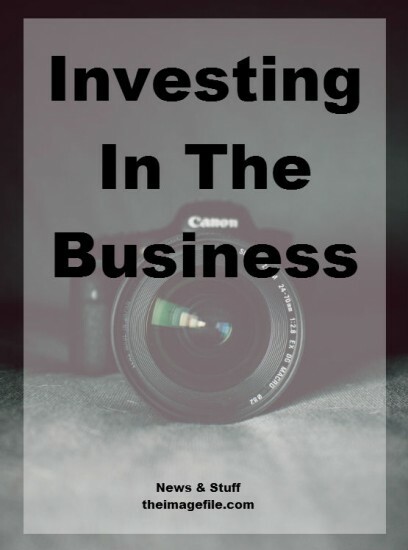 How do you invest in your business?